We’ve always found it quite interesting learning where other food businesses operate from - it’s one of those things that endlessly intrigues you, but you can never quite pin point exactly why it’s so fascinating. And when we moved to our new home in Vauxhall back in January, we thought we were a solo health company in a playground of building sites, fancy new apartment blocks and US embassy buildings. But how wrong we were! It turns out Aduna, (delicious, african superfoods with hard to pronounce names, beautifully patterned packaging - you know the ones!) are practically our neighbours. Q. Andrew, where did you get the idea of creating Aduna and how did you come up with the name? A. I spent several years working in a London ad agency and despite learning a huge amount, I felt an acute lack of purpose in what I was doing. This lead to an existential crisis, which in turn lead to a nervous breakdown. At the age of 25 I found myself clinically depressed and suicidal. When I was at my lowest ebb I got a random call from a family friend offering me the opportunity to volunteer in The Gambia. Just three weeks after arriving I came back to life and ended up staying for almost four years, working with small-scale producers of fruits and vegetables. I got completely inspired by the vibrancy of Africa and the power of entrepreneurship to create a positive social impact. I started to focus on ways to scale this up. Aduna was the answer. Aduna means ‘life’ or ‘world’ in Wolof, the main local language of Senegal and The Gambia, and it embraces a beautiful philosophy of how we should live our lives here on earth. Kind of like a West-African version of karma. In personal terms, Aduna the brand is about sharing with the world what Africa gave me, which is nothing short of life itself. A. The first product we launched was Baobab Superfruit Powder. Baobab is an African fruit that dries on the branch, producing a sweet and citrussy powder that is rich in vitamin C, 50% fibre and contains more antioxidants than any whole fruit. There is no such thing as a baobab plantation; every tree is community or family-owned. 10 million households can supply this fruit from a crop that is so abundant it currently goes mainly to waste. My first encounter of baobab was when I was living in The Gambia. My adopted mum, Fanta, used to make baobab juice for me, which I blended into my protein shake before going to the gym. I didn’t know much about it, but I loved the taste and it’s one of those things that you can just tell is good for you. It was years later that I learned more about its amazing nutritional profile, health benefits and potential for social impact. In 2011 I met my co-founder Nick and we started brainstorming on how to create baobab as a billion dollar industry for rural Africa. Our NPD strategy is simple - we identify Africa’s most nutritious and under-utilised ingredients and turn them into functional and delicious health foods. Our range now includes Baobab, Moringa and Super-Cacao superfood powders and raw energy bars made from cold-pressed fruit and nuts featuring our African ingredients. A. Throughout my twenties I had lots of business ideas, but never quite made the leap. But this time it was different. I had a very strong calling and the sense that it was “now or never” – I simply had to do it. A. It’s not easy. We initially thought that if we took a brilliant product (like baobab), put it in beautiful packaging (like ours) and got it listed on the shelves of ideal retailers that it would just fly off the shelves. Wrong. There was absolutely zero automatic rate of sale and we were very quickly at serious risk of delist. Our solution was to recruit a small army of volunteers who were inspired by our mission to sample our products in the likes of Planet Organic and Wholefoods. As a result of this we took baobab from obscurity to a best-selling superfood. When it comes to food, sampling is absolutely fundamental. A. One of my greatest Brand Heros is a company called Sambazon. They were one of the first companies to bring acai berries to the global market and have proven that you can combine commercial success with positive social impact. They are big believers in higher consciousness both socially and environmentally, and currently provide over 10,000 jobs to local communities, preserve countless acres of rainforest, and their products are awesome. I’m very proud to say that we also have Ryan Black, their Co-Founder and CEO as one of our investors! A. Entrepreneurship is a rocky path beset by obstacles, setbacks and challenges and it would be fair to say that if I was doing it for the money I would have given up a long time ago. What inspires me to keep going is our higher purpose: making a real and meaningful positive impact on the lives of the communities where our products come from. I was lucky enough to visit our baobab supply chain in Northern Ghana back in April – for the first time in two years - and it was absolutely mind blowing. Some of the households have increased their annual income by more than ten times, and hearing this directly from the people involved is very powerful. We want to make this impact available to as many communities and households as possible. Q. What makes Aduna different? Aduna focuses on products that are completely unknown and introduces them to the market. We work all the way from the villages in rural Africa through to the High St in the UK and around the world, connecting individual producers with individual customers. This direct, high-impact sourcing model is what truly makes us different. Believe it or not, Aduna actually has a 35 year plan. Our ultimate vision is to become the world’s first Africa-inspired global lifestyle brand and social business that promotes and celebrates the vibrancy of Africa and positively impacts the lives of millions of people worldwide. On the way we have some very exciting new product launches that will take us into new segments of the market – keep your eyes peeled! Andrew Hunt is Co-Founder and Managing Director of Aduna. Aduna is an Africa-inspired health food brand bringing African superfoods to the global market. Aduna’s award-winning range of African Superfood Powders and Fruit & Nut Energy Bars are sold in over 1,000 stores in the UK. Through the company’s baobab supply chain in Northern Ghana, almost 1,000 women are benefiting from sustainable income streams. Powders start from £5.99 and bars from £1.89. Find out more at www.aduna.com or follow @adunaworld. And we can truly contest to the quality of these powders - after using them in the kitchen to create the recipe below, we were pretty blown away by the quality and flavour (not to mention how beautiful they look on the shelf!). Grab the recipe for our Pollen + Grace x Aduna Raw Cacao Brownies with Orange + Baobab Sauce HERE. 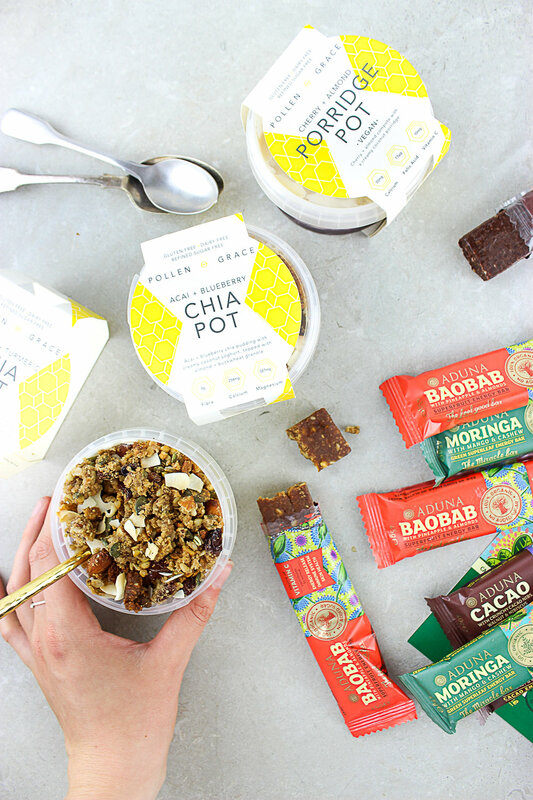 Want to try Baobab’s energy-boosting powers for yourself?We’re giving away breakfast for your and the whole office! For the chance to wine 10 Pollen + Grace breakfast pots as well as a case of Aduna’s superfood bars, simply head HERE. London-based only, competition ends on 24/09/17. Good luck!